Objectives: To assess and correlate the oocyte morphological characteristics and embryo development in women with normal serum anti-Mullerian hormone (AMH) levels for different age groups women undergoing in vitro fertilisation (IVF). Materials and Methods: It is a retrospective study. A total of 92 women undergoing IVF treatment with normal AMH levels within two different age groups were included in the study based on retrospectively collected data from medical records. Based on age, women were subdivided into two groups: Group A with age >23 to <30 years (n = 40) and Group B with age >30 to <38 years (n = 52). The oocyte morphological characteristics were assessed and scored based on previously published method with minor modifications. Oocytes and embryo development were correlated in both groups with different age women (>23 to <30) Group A and (>30 to <38) Group B. Results: Patients’ demographic characteristics did not show significant difference in Groups A and B, except age (P < 0.05). Number of oocyte retrieved, number of mature MII oocytes and fertilization rate have not changed in both the groups. Good quality embryo development significantly improved in Group A than that in B (P < 0.05). Even mature oocyte number in both the groups was not statistically significant. However, oocyte morphological characteristics such as (1) oocyte overall morphology, (2) zona pellucida color and thickness, (3) size of perivitelline space (PVS), (4) presence of granules and (5) morphology of polar body and pattern of cytoplasm were significantly affected in Group B older age group women when compared with younger group women (Group A). Conclusion: AMH seems to be a better predictor of quality of oocytes and subsequently embryo development in older age group women when compared to the younger group women. Normal AMH level is a better predictor for ovarian reserve and along with this, it may help to predict oocyte quality and embryo development in older women undergoing IVF. Statistical Analysis: A student t test was applied to compare the means of two groups by online GraphPad software (www.graphpad.com/quickcalcs/, GraphPad Software, La Jolla, CA, USA). A P < 0.05 was considered statistically significant. Ethics: This is a retrospective study, and informed, signed consent was obtained from every couple prior to IVF treatment. Further, permission to use their data for analysis with guarantees of confidentiality was obtained. This study was exempted of institutional review board approval, since it involved only the analysis of medical records from established clinical practices. Anti-Mullerian hormone (AMH), a dimeric glycoprotein, is a member of the transforming growth factor-β superfamily, which acts on follicular maturation and growth., AMH is produced by granulosa cells from preantral and small antral follicles., AMH level in blood was found to be minimal or absent at the birth of female and detectable after puberty. The level of AMH expression in female is age dependent and decreases as the age advances and becomes undetectable toward menopause., It has been found that AMH levels remained constant in normal menstrual cycles, and the inter and intracycle variation is very low. AMH level also seems to be minimally affected by conditions such as pregnancy, GnRH agonist treatment and short-term contraceptive pills. It has been reported that serum AMH strongly correlates with the number of developing follicles as it is produced by small growing follicles., Serum AMH is an indirect marker of ovarian reserve and has a good correlation with antral follicular count (AFC)., The AFC is less sensitive than the measurement of serum AMH levels as AMH reflects preantral and smaller follicles which is smaller than 2 mm size and can be hardly seen on the ultrasound scanning. Oocyte development during folliculogenesis is affected by AMH levels. AMH level in the follicular fluid may affect the embryo development and the functional capacity of oocyte. The present retrospective study aimed to correlate basal normal AMH level with oocyte morphology and embryo development potential. Further, it will also help in understanding the direct role of serum AMH concentration on oocyte quality in women undergoing controlled ovarian stimulation. This retrospective study was performed from cases attended between 20th December 2017 and 25th March 2018 at Medicover Fertility, New Delhi, India. A total of 92 women undergoing controlled ovarian stimulation with GnRH antagonist protocol with IVF-ICSI with husband or donor sperms were included for the data analysis. 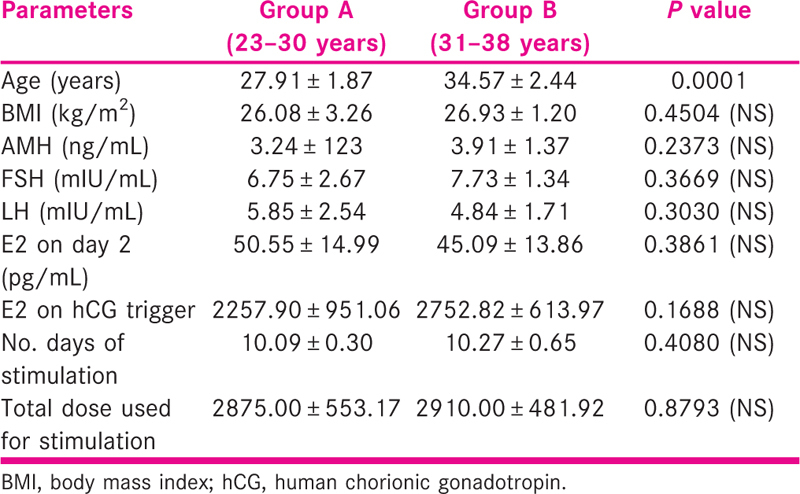 Women were further stratified into two groups Group A (40 patients) and Group B (52 patients) based on age, Group A (23–30 years) and Group B (31–38 years). Inclusion criteria: women with age of >23 and <38 years, normal AMH levels, normal stimulation responders, without any ovarian pathophysiology, number of oocytes retrieved between 5 and 15. Exclusion criteria: Age <23, age >38 years, women with ovarian pathophysiology, serum E2 >85 on day-2, serum estradiol level on the day of trigger >3500. Serum AMH was performed, in the cycle prior to starting controlled ovarian stimulation (COS) on day-2 to day-4. AMH measurement was taken by using chemiluminescence method, and this method was outsourced from Quest Diagnostics, Gurgaon. Recombinant gonadotropins were started on day 2/3 of cycle after checking the serum LH and E2 value. Dose was individualized according to AMH level, AFC on day 2 and body mass index (BMI). Pituitary downregulation was achieved by adding GnRH antagonist (Cetrotide® Sorono 0.25 mg) on day-6 of stimulation (fixed protocol). Serum estradiol was repeated on day-6 and on the day of trigger. Trigger (Ovitrelle® 0.25 mg Merck) was given when at least three follicles reached >17 mm diameter and E2 was adequate. Ovum pick up was accomplished transvaginally under ultrasound guidance 35 h after trigger. In our study, the correlation of AMH was studied with oocyte quality and embryo development potential. Women were further stratified into two age groups and the effect of AMH on oocyte quality in both the age groups were compared. Morphological assessment of oocytes retrieved was performed on the bases of (1) oocyte overall morphology, (2) zona pellucida color and thickness, (3) size of perivitelline space (PVS), (4) presence of granules and (5) morphology of polar body (PB) and pattern of cytoplasm. Each parameter was further assigned a score of 0, 1, 2 for poor, average and normal oocyte, respectively. Taking all parameters, a total score of 10 indicated normal oocyte grade, and a score of 5 was for average oocyte grade. All oocytes were subjected to intra cytoplasmic sperm injection (ICSI) with male partner sperm or with donor sperm as per consent. Oocyte fertilization was assessed 18 h post ICSI based on pronucleus (PN), second PB appearance, as well as PN size and shape with the alignment of PN precursor bodies. All oocytes were cultured in individual droplet culture method. On day-2 and day-3, embryo quality was evaluated and graded based on Istanbul consensus embryo assessment method. Embryo grading was performed based on Istanbul consensus, Grade A is <10% fragmentation, stage specific cell size, no multinucleation, Grade B is <10–25% fragmentation, stage specific cell size for majority of blastomeres, no evidence of multinucleation. Grade C is >25% fragmentation, cell-size not stage-specific and evidence of multinucleation. In this study, women were divided into two groups as Group A (23–30 years) and Group B (31–38 years). The patients’ characteristics in both the groups were as follows: age, BMI, AMH, LH, E2 on day-2, E2 on day of human chorionic gonadotropin (hCG) trigger, number of days stimulation and total dose used for stimulation. These characteristics were not significantly different in both the groups [Table 1]. Total dose used in the Group B older age women was higher; however, they were not statistically significant. [Table 2] describes oocyte parameters such as total number of oocytes collected, total number of mature oocytes (MII) retrieved in controlled ovarian stimulation, fertilization rate, Grade A and B embryo formation rate in both the groups. There is no statistically significant difference in the total number of oocytes collected, mature oocytes collected and fertilization rate. However, there is significant difference in the Grades A and B embryo development in the two groups. It has been shown that significantly higher number of good quality embryos were formed in the Group A compared to Group B. Interestingly, Grade B embryos formation rate was higher in Group B women with older age group. The oocyte characteristics such as oocyte overall morphology, zona pellucida, color and thickness, size of PVS and presence of granules, morphology of PB, and patterns of cytoplasm were analyzed in both the groups. It is shown in [Table 3] the above five oocyte parameters that significantly predicts the oocyte quality in women undergoing IVF. Furthermore, overall oocyte quality score for the five parameters for the five parameters was analyzed in both the groups. The oocyte quality score was higher in group A when compared to Group B.
AMH is considered as a reliable hormonal marker for ovarian reserve. It gives a more objective evaluation of ovarian reserve independent of the cycle day. AMH has been used as a tool for predicting response to controlled ovarian stimulation in IVF cycle. In the current study, AMH level at the start of stimulation did not correlate with the number of mature oocytes and fertilization rate in younger women. The current results showed a negative correlation between higher AMH levels with older women and poor embryo development. Moreover, oocyte characteristics have also shown same pattern such as poor quality oocytes development in older age group women with normal AMH levels (Group B). In 2011, a study published by Irez et al. concluded that AMH levels may help in predicting the oocyte quality. Another study by Wang et al. concluded that AMH concentrations were associated with higher clinical pregnancy rate in women between 34 and 41 years of age. On the contrary, Smeenk et al. have demonstrated that basal AMH level is not related to embryo quality. It was observed that, oocyte quality and grades of embryos formed were better in women with age <30 years (Group A) compared to Group B (31–38 years). However, In Group A, the quality of oocytes, fertilization rate, as well as grades of embryos were not correlating with the AMH value. In women with older age group (Group B) the quality of oocytes and grades of embryos formed were inferior when compared with younger age group women (group A). However, oocytes quality and embryo grading in women with age >30 years correlated with the serum AMH level. In older age group, it was seen that as the AMH value decreased, the quality of oocytes was also compromised and there were more number of Grade B embryos formed in this group. Similar to the present findings, Re-Enner et al. concluded that significantly higher numbers of good quality oocytes were retrieved in women with normal AMH value compared to women with low or high AMH value; however, there was no significant correlation of fertilization rate with AMH value. Further, they also observed that AMH value of <1.6 ng/mL was associated with morphological abnormality in oocytes. Another study by Guerif et al. failed to show any effect of AMH on oocyte nuclear maturity and development. However, in this study, we observed the effect of AMH in different age groups and concluded that AMH had no effect either on oocyte quality or grades of embryos formed in younger women with <30 years of age. It was observed that in women with age more than 30 years, AMH was significantly correlating with the quality of oocytes and grades of embryos formed. Interestingly, more number of Grade B embryos were formed in this group. It has been reported that there is a positive correlation between serum AMH levels and follicular fluid AMH levels, thus, concluding that serum AMH may predict the quality of oocyte retrieved. Similar to this, our study also concluded that AMH can be a reliable marker to predict oocyte quality in older women. In our study, we found no correlation between normal (age specific) AMH level and the number and quality of oocytes retrieved and fertilization in young women, age <30 years. However, oocyte quality and embryo development potential were affected by AMH value in older age group. There was no effect on fertilization rate, but embryo development was compromised, and a less number of good grade embryos were formed in women in Group B. This study concluded that AMH can be used to predict the quality of oocytes and formation of good grade embryos in older women with age >30 years. Our study concluded that AMH can be a reliable marker for predicting oocyte quality and grades of embryos formed in older women; however, it is of limited significance in predicting the oocyte quality in younger women. Major limitation of this retrospective study was AMH and embryo development correlation with pregnancy outcome, further larger prospective studies may help to validate this study findings. Josso N, di Clemente N. TGF-β family members and gonadal development. Trends Endocrinol Metab 1999;10:216-22. Agarwal S, Malhotra N. Anti-Mullerian hormone − Promises and pitfalls. Fertil Sci Res 2016;3:58-62. Durlinger AL, Visser JA, Themmen AP. Regulation of ovarian function: The role of anti-Mullerian hormone. Reproduction 2002;124:601-9. Weenen C, Laven JS, Von Bergh AR, Cranfield M, Groome NP, Visser JA et al. Anti-Mullerian hormone expression pattern in the human ovary: Potential implications for initial and cyclic follicle recruitment. Mol Hum Reprod 2004;10:77-83. Rajpert-De Meyts E, Jørgensen N, Graem N, Müller J, Cate RL, Skakkebaek NE. Expression of anti-Müllerian hormone during normal and pathological gonadal development: Association with differentiation of Sertoli and granulosa cells. J Clin Endocrinol Metab 1999;84:3836-44.
de Vet A, Laven JS, de Jong FH, Themmen AP, Fauser BC. Antimullerian hormone serum levels: A putative marker for ovarian aging. Fertil Steril 2002;77:357-62. Mulders AG, Laven JS, Eijkemans MJ, de Jong FH, Themmen AP, Fauser BC. Changes in anti-Mullerian hormone serum concentrations over time suggest delayed ovarian ageing in normogonadotrophic anovulatory infertility. Hum Reprod 2004;19:2036-42. La Marca A, Malmusi S, Giulini S, Tamaro LF, Orvieto R, Levratti P et al. Anti-Mullerian hormone plasma levels in spontaneous menstrual cycle and during treatment with FSH to induce ovulation. Hum Reprod 2004;19:2738-41. Laven JS, Mulders AG, Visser JA, Themmen AP, De Jong FH, Fauser BC. Anti-Mullerian hormone serum concentrations in normoovulatory and anovulatory women of reproductive age. J Clin Endocrinol Metab 2004;89:318-23. Pigny P, Merlen E, Robert Y, Cortet-Rudelli C, Decanter C, Jonard S et al. Elevated serum level of anti-Mullerian hormone in patients with polycystic ovary syndrome: Relationship to the ovarian follicle excess and to the follicular arrest. J Clin Endocrinol Metab 2003;88:5957-62.
van Rooij IA, Broekmans FJ, te Velde ER, Fauser BC, Bancsi LF, de Jong FH et al. Serum anti-Mullerian hormone levels: A novel measure of ovarian reserve. Hum Reprod 2002;17:3065-71. Fanchin R, Schonauer LM, Righini C, Guibourdenche J, Frydman R, Taieb J. Serum anti-Mullerian hormone is more strongly related to ovarian follicular status than serum inhibin B, estradiol, FSH and LH on day 3. Hum Reprod 2003;18:323-7. Dewailly D, Andersen CY, Balen A, Broekmans F, Dilaver N, Fanchin R et al. The physiology and clinical utility of anti-Mullerian hormone in women. Hum Reprod Update 2014;20:370-85. Seifer DB, MacLaughlin DT, Christian BP, Feng B, Shelden RM. Early follicular serum Mullerian-inhibiting substance levels are associated with ovarian response during assisted reproductive technology cycles. Fertil Steril 2002;77:468-71.
van Rooij IA, Broekmans FJ, Scheffer GJ, Looman CW, Habbema JD, de Jong FH et al. Serum antiMullerian hormone levels best reflect the reproductive decline with age in normal women with proven fertility: A longitudinal study. Fertil Steril 2005;83:979-87. Hazout A, Bouchard P, Seifer DB, Aussage P, Junca AM, Cohen-Bacrie P. Serum antiMullerian hormone/Mullerian-inhibiting substance appears to be a more discriminatory marker of assisted reproductive technology outcome than follicle-stimulating hormone, inhibin B, or estradiol. Fertil Steril 2004;82:1323-9. Peñarrubia J, Fábregues F, Manau D, Creus M, Casals G, Casamitjana R et al. Basal and stimulation day 5 anti-Mullerian hormone serum concentrations as predictors of ovarian response and pregnancy in assisted reproductive technology cycles stimulated with gonadotropin-releasing hormone agonist-gonadotropin treatment. Hum Reprod 2005;20:915-22. Shebl O, Ebner T, Sommergruber M, Sir A, Tews G. Anti Muellerian hormone serum levels in women with endometriosis: A case-control study. Gynecol Endocrinol 2009;25:713-6. Pigny P, Jonard S, Robert Y, Dewailly D. Serum antiMullerian hormone as a surrogate for antral follicle count for definition of the polycystic ovary syndrome. J Clin Endocrinol Metab 2006;91:941-5. Lie Fong S, Baart EB, Martini E, Schipper I, Visser JA, Themmen AP et al. Anti-Müllerian hormone: A marker for oocyte quantity, oocyte quality and embryo quality? Reprod Biomed Online 2008;16:664-70. Talebian S, Licciardi F, Liu M, Grifo JA, Krey LC. Assessing anti-Mullerian hormone (AMH) as a marker of ovarian response in anonymous oocyte donors: Quantity or quality? Fertil Steril 2008;90:S267. Riggs R, Kimble T, Oehninger S, Bocca S, Zhao Y, Leader B et al. Anti-Müllerian hormone serum levels predict response to controlled ovarian hyperstimulation but not embryo quality or pregnancy outcome in oocyte donation. Fertil Steril 2011;95:410-2. Loh JS, Maheshwari A. Anti-Mullerian hormone − Is it a crystal ball for predicting ovarian ageing? Hum Reprod 2011;26:2925-32. Silberstein T, MacLaughlin DT, Shai I, Trimarchi JR, Lambert-Messerlian G, Seifer DB et al. Mullerian inhibiting substance levels at the time of hCG administration in IVF cycles predict both ovarian reserve and embryo morphology. Hum Reprod 2006;21:159-63. Smeenk JM, Sweep FC, Zielhuis GA, Kremer JA, Thomas CM, Braat DD. AntiMüllerian hormone predicts ovarian responsiveness, but not embryo quality or pregnancy, after in vitro fertilization or intracytoplasmic sperm injection. Fertil Steril 2007;87:223-6. Lazzaroni-Tealdi E, Barad DH, Albertini DF, Yu Y, Kushnir VA, Russell H et al. Oocyte scoring enhances embryo-scoring in predicting pregnancy chances with IVF: Where it counts most. PLoS One 2015;10:e0143632. Balaban B, Brison D, Calderón G, Catt J, Conaghan J, Cowan L et al. Alpha Scientists in Reproductive Medicine and ESHRE Special Interest Group of Embryology. The Istanbul consensus workshop on embryo assessment: Proceedings of an expert meeting. Hum Reprod 2011;26:1270-83. Irez T, Ocal P, Guralp O, Cetin M, Aydogan B, Shamay S. Different serum anti Mullerian hormone concentration are associated with oocyte quality, embryo development parameters and IVF-ICSI outcomes. Arch Gynecol Obset 2011;284:1295-301. Wang JG, Douglas NC, Nakhuda GS, Choi JM, Park SJ, Thornton MH et al. The association between anti Mullerian hormone and IVF pregnancy outcome is influenced by age. Reprod Biomed Online 2010;21:757-61. Re-Enner T, Sommergruber M, Moser M, Shebl O, Schreier-Lechner E, Tews G. Bsal level of anti Muellerian hormone is associated with oocyte quality in stimulated cycles. Hum Reprod 2006;21:2022-6. Epub 2006 May 5. Guerif F, Lemseffer M, Couet ML, Gervereau O, Ract V, Royere D. Serum antiMullerian hormone is not predictive of oocyte quality in vitro fertilization. Ann Endocrinol 2009;70:230-4. Fanchin R, Louafi N, Méndez Lozano DH, Frydman N, Frydman R, Taieb J. Per-follicle measurements indicate that anti-Müllerian hormone secretion is modulated by the extent of follicular development and luteinization and may reflect qualitatively the ovarian follicular status. Fertil Steril 2005;84:167-73.